According to biologists at Vertex Water Features, during summer months when water is warm, oxygen can be consumed faster than it can be replenished. Ponds and lakes may become “stratified”. Warmer, oxygen-rich upper water lays on top of cool, deep, dense water with lower oxygen. These conditions reduce available fish habitat. Beneficial bacteria that slows the breakdown of organic matter on the bottom of the lake leads to muck buildup. Excess nutrients from muck are made available for weed and algae growth. Noxious ammonia and hydrogen sulfide gasses cause odor problems. Extreme pond or lake stratification also causes pH to rise among surface waters. When this occurs, algae species preferring high pH, or still-water habitats, tend to be unpalatable types that do not enter the fish food chain or toxic algae that can make swimmers sick. During cooler months, stratified ponds and lakes can experience problems when they suddenly destratify during wind and storm events. De-oxygenated bottom waters, laden with toxic gasses, can suddenly rise to the surface, resulting in massive fish kills and/or odor problems. Nutrients trapped in bottom waters may cause sudden algae blooms when released to the surface. 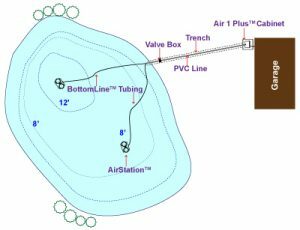 Vertex aeration systems create a vertical current using millions of small bubbles that entrain the water column. This concept “turns the lake over” and allows oxygen to be absorbed at the lake’s surface. By moving lower-oxygen water up from the bottom and eliminating thermal stratification, oxygen levels increase. Wide swings in oxygen are stabilized, preventing fish kills. Vertex systems also improve sport fisheries by allowing fish to expand their territory. 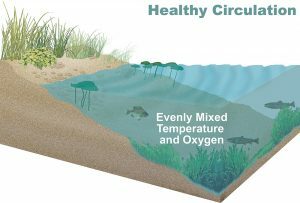 Formerly oxygen-deprived areas provide ideal habitat for organisms in the fish food chain. This entry was posted on Monday, June 27th, 2016 at 6:54 pm	and is filed under News & Updates. You can follow any responses to this entry through the RSS 2.0 feed. Responses are currently closed, but you can trackback from your own site.